Twirl the ball backwards from fingertips to palm. Bend your knees, make the T with your fingertips. Aim just over the front rim. Release and follow-thru towards the hoop, not back. You gotta hit your free throws. Some purists, George Will types mostly, claim baseball to be the greatest of our sports, because it is untimed. Therefore, a team can and will trail but can never be counted out by the clock. They get their three outs to keep themselves alive. Yet in basketball the clock does stop and allow for free throws, the shots that salt away leads or chip away at deficits, and the game is reduced to its similarly pure form: one player, one ball, one basket. It’s both beautifully basic and terrifyingly naked. There’s no defense, quite literally, for a miss. And tonight in San Antonio, there were plenty of misses and no defense. In the most tense, exciting, and dramatic NCAA Championship of the decade, the overtime spectacle really lasted only 40 minutes. For once the Final Four orphans Memphis and Kansas tipped off their five minute curtain call re-knotted at 63, the game was over before it began again. The look on the sidelines said more than enough. Kansas players pushed each other and fidgeted in their seats, eventually standing up and hopping with anticipation. On the other sideline, the Tigers sat stonefaced, occasionally glancing up at the scoreboard like they were looking for a stolen wallet. Derrick Rose cramped up at the end of regulation and had to be helped off the court, only to be shoved back out there to save the season. It could have all been over with, if. Carolina Blue and Westwood Gold suffered spankings on Saturday night, but their fates now seem much more preferable to the public gutwrenching of the Memphis Tigers and their two leaders, the All-America Chris Douglas-Roberts and the All-But-Gone Rose. The four missed free throws between them in the final 1:15, especially CDR’s no-for-two with 16 seconds left, opened the door on an improbable 9 point, 2 minute Jayhawk comeback a sliver of an inch. And, once Coach John Calipari’s goal of fouling to prevent chaos went down the drain (“We didn’t foul hard enough,” he offered), Mario Chalmers snuck around a high screen and launched a three point dagger (“Like I was in my own backyard,” he said to FOX Radio) that dropped through the net, the net of Jordan, Lorenzo Charles, Keith Smart, Scotty Thurman, and the other faded memories of NCAA titles long past. Memphis sleptwalked through the overtime, an eventual 75-68 final, and is now left to daydream about the nets they didn’t cut down. The NCAA runners-up cap off the winningest season in college basketball history with the most painful loss in title game history. No team has ever blown such a large lead in a small frame of time. It takes a great deal to wipe Darius Washington’s agony off the list of the most painful charity stripe moments in a school’s history, but even as we speak these free throws are joining Bill Buckner at Shea, Jean van de Velde in the wee burn at Carnoustie, and Gene Mauch and the Phightin’ Phils, taking their seat on Scott Norwood’s 38 yard line. Memphis has had a fairly nondescript basketball past, with a couple of Final Fours and the receiving end of Bill Walton’s biggest day. Tonight they had their best chance to date to unfurl a banner, and oh, once you get one, they can’t take it away. The worst part is that no one–not Bill Self, not Mario Chalmers, not Billy Packer–no one took it away, either. In gagging on the sport’s most basic play, the Tigers simply failed to take what was rightfully theirs. It’s a sharp gouge to the basketball fan’s soul. But it’s a hurt with blame attached to it. Even the aforementioned Rumeal Robinson, a Michigan man with the 64% touch, nailed down the 1989 championship (in overtime, no less) with two straight swishes to give interim coach Steve Fisher an interim one-point title victory. The free throw comes down to focus and mechanics; some kids have ’em, some kids don’t. And the two players that didn’t were the architects of this whole empire; everything this team had built rested on their shoulders. It was their right to go up to that line and cinch the glory. And they couldn’t do it. 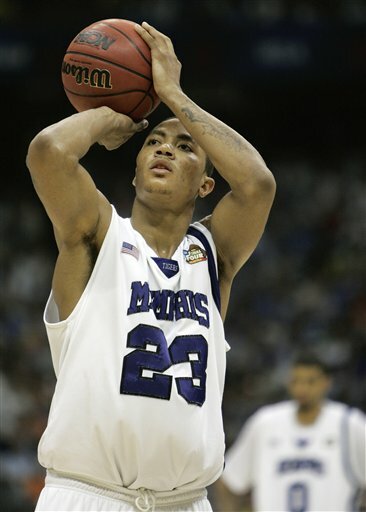 One more make and the story of the 2008 Memphis Tigers is of a breakneck, athletic, speedy and utterly dominating (nearly 19 ppg average margin) force, one of the great teams of the decade and maybe of all time (a win would have ended them at 39-1). But the result is what it is, and now the late-game woes will be seen as a microcosm of their season, a slow pendulum swinging all year long and waiting to rear its ugly head at an inevitably climactic moment. And it did, and so shall it be. Now Memphis has hit its head on the top of the curve, and away they go from grand pomp to dire circumstances. Rose and Douglas-Roberts are likely gone; Calipari’s road won’t get much easier anytime soon, and everywhere they go, the team will be hounded by the airing of their own hideous baggage. Teams from the non-power conferences don’t get many chances at the top; check out where Cincinnati or UNLV are right now, far removed from past glories. For 6 months, 38 minutes, and 9 seconds, the University of Memphis had just about the best basketball team in the country. Sometimes, though, you only get one shot to stand alone.